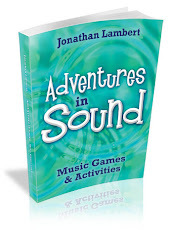 Regular readers will know I post a free music game at the beginning of every month on the PlayWithSound website. This month's is called Supercar and is a rhythm and speaking game, equally suited to both music classes and drama workshops. It requires neither instruments nor any specialist knowledge but will nevertheless give your students and colleagues something to get their teeth into. Four breakages in one session last week and none in any others. Coincidence? The children were not unruly and in each case the damage could be put down to 'fair wear and tear'. This session was different in that, because the materials had not arrived for the instrument-making session I had intended, I implemented a Plan B. The session was one that is familiar to music teachers across the land. In fact I'd walked in on one earlier in the week. Every child held some kind of percussion instrument and was ostensibly composing a piece of music. The teacher was sitting at a desk in the corner, beyond numb. It was impossible to hear what any of the groups (each of three or four children) was playing and I doubt the participants had any real sense of what they had created until they premiered it for the rest of the class at the end of the lesson. 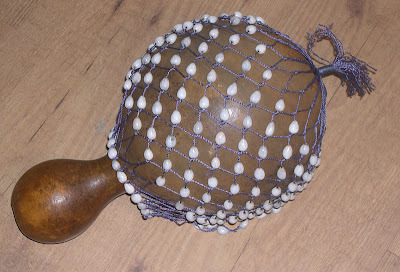 The casualties in my session were an mbira (key detached), a dulcimer (broken string), a stick tambourine (jingles fell off) and my beloved kokiriko, pictured (the string snapped). The first three are easily mended but the kokiriko was assembled by the hands of someone who knew their craft. Restringing it will be a project in itself. So why the damage? It's no coincidence that when teenagers form bands they usually do it in groups of three or four and don't practise in the same room as all the other bands. When you can't hear the instrument you are playing it's natural to play it a bit louder. If you still can't hear it you play it louder still. The fact is that good instruments, of the kind that inspire children, are often delicate and expensive and need close supervision. You need instruments built like tanks for the kind of session described above. So why do we teach music in this way? If you learn an instrument you are usually taught one-to-one or occasionally in small groups. It is accepted that you need to hear what you are doing. There are lots of useful things we could teach children but choose not to either because we lack the facilities (astronomy, skiing, bricklaying) or because we simply choose not to (typing, cycle maintenance). So why do we persevere with classroom music when we lack the space and staff to make it worthwhile? It has reputation amongst children as being a 'doss' subject. Unfortunate, perhaps, but fully deserved under the circumstances. My childhood experience of classroom music involved a genial old bloke chatting to us about everything under the sun, including, but only occasionally and in passing, music. (I didn't really get what we were doing until I studied philosophy at university some years later.) There was a piano in the room but he never played it, perhaps because he didn't think we would appreciate it or perhaps because he knew better than to turn his back on us. Or maybe he couldn't bear the fact that it remained untuned from one year to the next. I wonder what he would have made of the National Curriculum? It's contents may be workable in a school with excellent facilities and well-disciplined, bright and motivated children. In many places even trying to implement it smacks of appeasement and I'm sure the old chap would have had none of it. There's a film called Baghdad Cafe (Percy Adlon, 1987) in which a child plays a piano keyboard that makes no sound, being just a two dimensional drawing on a piece of wood. I saw the device used more recently in Honeydipper (John Sayles, 2007). The idea is that as you run your fingers over the 'instrument' you imagine the imagine the sound. It can work as a solitary activity but is not much good for jamming with your mates. Last night I was playing some new material with Eastern Straynotes in the wonderful 13th century crypt that is Jurnets Bar. The audience usually includes a large proportion of discerning musicians so it feels better than usual when things go well (and correspondingly worse when they go badly). The gig went went reasonably smoothly but in one of the numbers I was still working out the best harmony to put under our guest singer's vocal line. Whereas it had been possible to ad lib in rehearsal to good effect it had relied on being able to hear myself. In a small room, with plenty of reflection off the walls, this was easy. But in a much larger room full of people the lower register on the clarinet was lost in the general fog of frequencies dominated by the bass and accordion. Fortunately, like the silent pianists in the movies, I had a reasonable idea of how the notes would sound against the voice and just hoped any errors were inaudible. This was by no means my first experience of being unable to hear myself when playing. The anatomy of a clarinet is such that the sound is directed away from the player. My tendency when this happens is to blow harder causing me to overblow and squawk horribly. In the late 80s I played tenor and soprano saxes in a loud rock band for a time. They had taught me four songs a night for four nights and I'd made notes of the riffs and chord sequences on a piece of paper. The first gig was in a hall in south London and I taped the paper to my microphone stand. My memory of the gig is hazy for reasons I won't go into here but it went down well with the audience and I was very relieved to have got through it. The relief evaporated in Reading, the following night, when I realised I'd left my piece of paper attached to the mic stand. One of the roadies, not understanding its significance, had thrown it away when he folded the stand. I spent the next year that I spent with the band trying to remember everything I was supposed to do. We never rehearsed again, but the task was made next to impossible by my inability to hear myself play most of the time. The guitarist's Marshall stack was positioned against the back wall each night, just a short distance behind me. No matter how hard I blew there was no way I could compete with that and whenever the sound engineer turned up my microphone to a level where I could hear myself as well the sound from the monitor speaker on the floor would feed back through the system causing that deafening shriek with which you must be all too familiar. 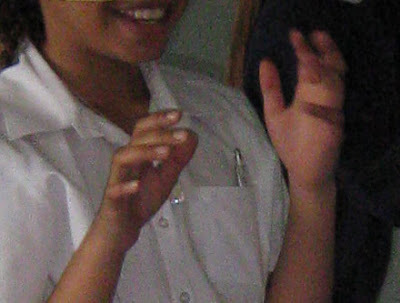 And so that was where I learned to play by the position of my fingers alone. Some nights I could hear myself, as could the audience. Some nights I couldn't be heard at all. But I've no doubt that the worst nights were those on which I could be heard by everyone except me. Any person with half a brain would shut up and mime but I just kept on trying. In Britain many artists spent inordinate amounts of time chasing grants of one sort or another. There is a whole army of arts bureaucrats who administer this money and many's the meeting I have attended where half of us are paid to be there while the other half are effectively paying to be there by way of forced inactivity. Because I find form-filling brain-deadening and infuriating it is my habit to piggy back on the applications of others, only spinning my own credentials when compelled. However, I have turned over a new leaf. Stage one of my grown-up attitude to getting work is attending a Presentation Skills course. It involves a day a week, sitting in a room with thirteen others, for three weeks. Last week was week two and we all had to give a five minute presentation to the tutor and our peers. I gave mine on 'Damage to Equipment in Music Departments' and stressed at the outset that this phenomenon extends to all areas of school and, in fact, to society at large. My superbly structured talk identified reasons for equipment failure including loss, theft, obsolescence and damage caused by poor storage (see picture). And then I moved on to the thrust of my argument, damage by children. All this is bad for both budgets and the environment. So what to do? a. robust and reliable - the wax crayon you used last week will still work today. Can you say the same about a felt tip? Wood, metal or plastic, anyone? b. immune from obsolescence - electronic technology moves so fast. What kid will be drawn to a five year old keyboard? Children don't make anything they use, it's all provided. 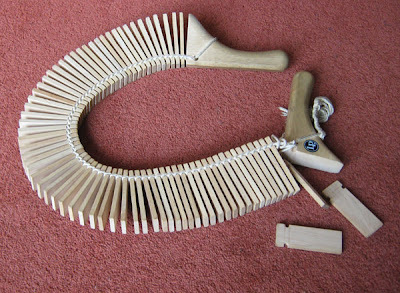 The last musical instrument they made was probably a 'shaker' in kindergarten. (They all knew it was really a rattle.) There is no depth of connection between them and the things they use. 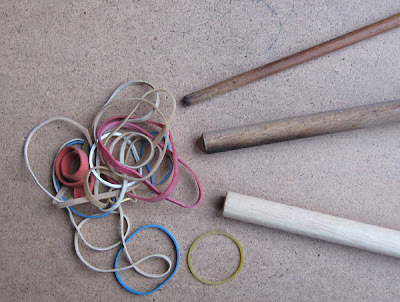 So now I introduced my prop - a stick and a pile of rubber bands - and demonstrated the beater I showed you a couple of posts back, showing how it could be repaired endlessly by the students themselves. I then waxed lyrical about how this approach develops problem solving and teaches use of materials. It also engenders a sense of ownership of the process. I waved a couple of other homemade instruments, both on the stick theme (watch this space), and urged them to apply this thinking to their own walks of life. And, while I'm riding this particular hobby-horse, I urge you to do the same. I didn't realise how conservative (please note the small 'c') I was until brewers started messing with pub names. After I have enforced world peace, and made being hungry illegal, my next act as global dictator will be to ban the re-naming of pubs. The only exceptions will be to allow hostelries suffering under travesties like 'Slug and Lettuce' to revert to their original names. They are, after all, the nation's history: we can re-examine it, re-interpret it but, Hollywood please take note, we should never re-write it. What I really like is local flavour. In Norfolk dialect, for example, here is pronounced hare so hairdressers have a field day with names such as 'Hair Now' and 'Hair to Impress'. Culture, as well as language is, a factor in the naming of establishments. My nearest pub is on the edge of an estate that acts as a magnet for police cars and social workers. 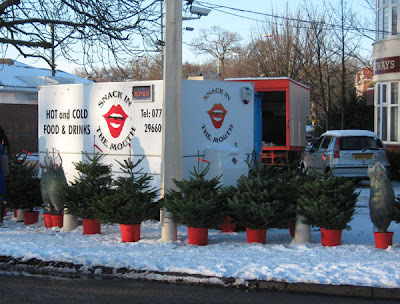 In the car park, under the pub sign, is a trailer-style fast food outlet whose name reflects the rough reputation of its hinterland. It took me a while to work out why it was called 'A Snack in the Mouth'. I hope, gentle reader, it takes you just as long. You probably think I have too much time on my hands. This morning I took three cardboard tubes of different lengths: 14" (35cm), 27.5" (70cm) and 59.5" (151cm). They are all open at both ends. First I used them as didgeridoos by blowing a tasteful and prolonged raspberry down them. On the sound clip you hear the longest tube first, followed by the middle tube and then a trumpet-like note on the shortest. Each gives concert Bb but they are an octave apart. Using embouchure control it is possible to bend the note and alter the tone. I confess I am no didge player - the embouchure doesn't sit well with playing a clarinet - but I assure you that, in the right hands, the cardboard didge will sound quite acceptable. Just be sure, like any wind instrument, to give it a chance to dry after playing or you may find yourself with a biology experiment on your hands. The fourth sound on the clip is the middle tube, which came from a roll of wrapping paper, being overdubbed to simulate a group of players. Great for 'swarm-of-flies' sound effects! Finally I hit the end of the largest tube with the soul of a slipper - a big insult to the tube, apparently. 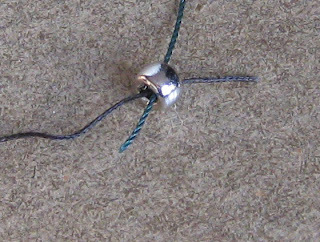 The knack is to cover the entire rim of the tube end as you strike, forcing the air inside to move. The sound is resonant but the last few hits are on the middle tube and this sound is less satisfactory. Because gripping the tube tends to inhibit its natural resonance, holding the tube vertically and dropping it onto the ground then quickly catching it gets the best percussive result. The long tube came from a material shop, the short tube from a roll of cling-film. 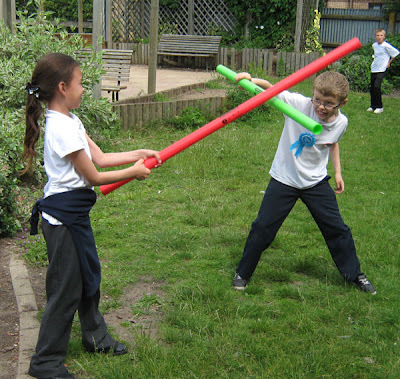 If you can get hold of plastic tubing you will find it both more resilient and more resonant. Different lengths produce different pitches, regardless of the material used. One of the best instruments I have played was assembled at a camp by a friend of mine. It used thick blue gas pipe cut into different lengths and tied to a frame like some enormous set of pan-pipes. A pair of table tennis bats was used to hit the the pipe ends (because flip-flops weren't wide enough to cover the whole hole). 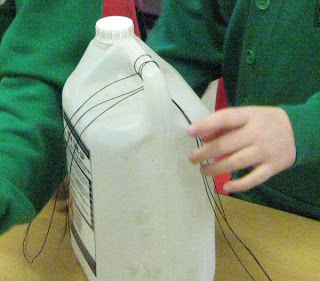 Plastic tubes can be struck against the ground or other hard surface to create a pitched sound. In the picture two proprietary tubes (called boom whackers) are being struck against each other to produce a chord. So now you've made your beaters let's find something to hit. At this point I should really mention health and safety. Although my own view is that health and safety policies are a curse and a kill-joy, nevertheless I realise that saying so in court will do little to reduce my penalty. I once asked a class of 12yr olds to 'bring in a home made instrument next week'. When next week came I was met with tin cans with jagged edges and glass bottles played with heavy sticks. In the event there were no breakages or injuries but I should have seen it coming. So if you are working with young children you may which to take reasonable precautions against injury. 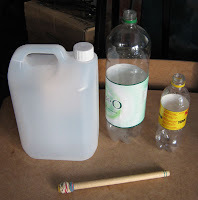 In Europe the ubiquitous 2ltr (about 70 fluid ounces) plastic bottle makes an excellent first drum. When empty and without the cap it makes a satisfyingly resonant sound when struck with your home made beater. 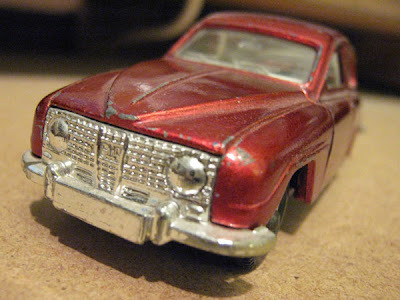 Compare the sound of the base with the side and do you prefer to used the rubber head of the beater or the wooden end? How about using the side of the stick? And when you hit the bottle hard does the sound just get louder or change in other ways? Experiment with the bottle and find the best places to hit. You could mark the 'sweet spots' with a permanent marker pen. The great thing about plastic bottles is that they can be held fairly firmly without damping. Some materials, metal in particular, can have their natural resonance restricted by holding. However, too strong a grip will have an impact on your botle so again, experiment and find the optimum firmness. If you hit the bottle hard enough, often enough, the plastic will lose its 'memory' or suffer punctures. 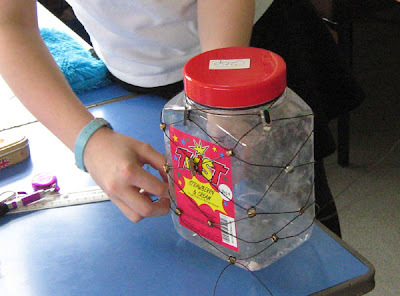 Your students will have fulfilled the urge to test the instrument to destruction and it can now be recycled in the usual way. Replacement will not impact on your pocket or departmental budget. Smaller plastic bottles tend to be too thin. A half litre bottle, hit on the side, requires subtlety and will not give much volume. The base, however, is surprisingly strong and gives a higher note than a larger bottle. Bigger plastic bottles, like the 5ltr (gallon) one in the picture are usually more robust although I prefer round sided bottles to this flat sided example. Here is a recording I made this afternoon of the 5ltr bottle (lid left on), 2ltr and 500ml bottles (lids removed). Ignore the loose drumming and enjoy the sounds of the bottles played together. 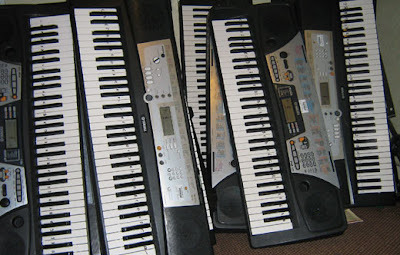 Just to be clear, I didn't play them all at once but overdubbed them using a trial version of Ableton Live. And I used my home made beater throughout. There was a time when it was considered important to teach children to sort instruments into categories such as aerophones, membranophones, idiophones and the like. It can be done in a classroom with lots of kids who, because they never get to touch (or even see more than a picture of) any of the instruments, will not disturb those trying to do maths in the classroom next door. A good five minutes could be spent debating whether a piano was a chordophone (because of its strings) or an idiophone (because the strings are hit with hammers). Most children, and especially boys, love to hit things. Using a beater rather than a hand allows greater force to be directed to a precise point. This can produce both greater volume and resonance. Most things can be hit with just a stick but this can cause damage, especially to membranophones where the skin (or plastic equivalent) can be punctured. So before we get into making drums, cymbals and other percussion from material destined for landfill or recycling, let's make some suitable beaters. A plain stick does for many things, especially metal objects. Find your stick, broom handle or whatever and cut it to the appropriate length. Try one foot (30cm) to start with. The thickness of your stick will have a bearing on its suitability. A length of broom handle may be fine for a steel hub-cap (if you are lucky enough to find one in the plastic age) but will be too 'heavy' for a biscuit tin. I'm not saying you can't use a heavy beater for a delicate object but doing so will restrict subtlety. 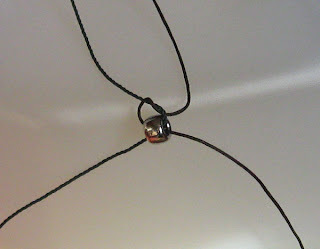 Wrapping the end of the beater in rubber, cloth or string will soften it. Whereas this is usually undesirable when hitting another wooden object, for many applications it allows the resonance of the instrument to be heard, making a more rounded sound in which the moment of impact is less pronounced. 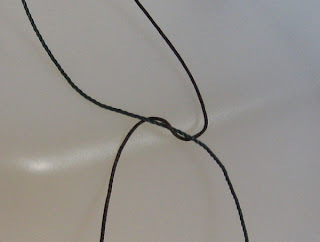 By wrapping one end of the beater in rubber you retain the option of using the hard end if that produces a more pleasing sound. Put your beater through the loop in the band and, starting about a centimetre from the end of the stick, pull the band tight against the wood. Twist the band and loop it over again. Repeat this, twisting and re-looping each time. Add another rubber band and repeat. It's really much more straightforward than it sounds. 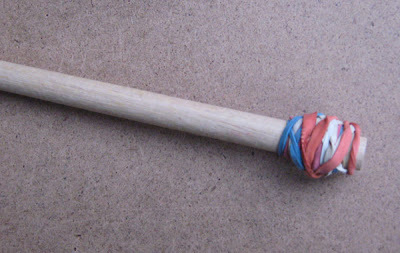 The finished beater in the picture was made with a 25cm (10") length of 12mm (half-inch) dowel used six rubber bands. The heads don't fly off like those from the catalogues, maintenance is a no-brainer and, if you involve your students in the making, they will be treated with respect and wielded with pride. Regular readers will know I post a different free music game at the beginning of each month. January's is called Mind the Gap and centres on the difference between pulse and rhythm, two concepts that are often confused. This game ably distinguishes between the two in a way no theoretical explanation can manage alone. I also put out a monthly newsletter, Playing With Sound, containing other ideas and activities. January's will go out in a day or two and includes a handy warm-up game called Follow That! with applications for language, drama and general activities as well as music. Signing up for the newsletter is free and you can unsubscribe at any time with just a click of your mouse. As well as the newsletter each month you will receive, initially, a short series of emails containing teaching ideas. I don't share my subscriber list with anyone else.